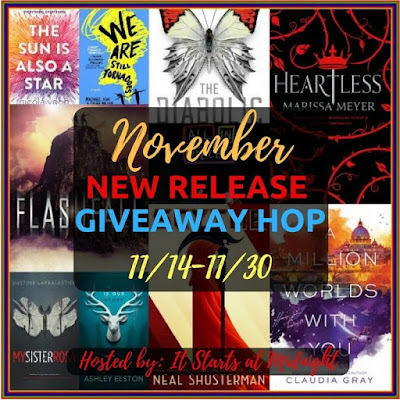 Enter this giveaway for a chance to win a November new release worth $16. Good luck! Rasputin: Faith, Power, and the Twilight of the Romanovs by by Douglas Smith is right at the top of my list so far. I've always been fascinated by this period in Russian history. I want to read The Whole Town's Talking by Fannie Flagg. I would love to read Heartless or Trouble Makes a Comeback. I am looking forward to Scorpius Rising by Rebecca Zanetti! I am looking forward to reading The Sun Is Also A Star because it has great reviews. I am looking forward to reading The Diabolic; I've heard a lot of good things. I'm looking forward to Heartless because I've seen several good review for it, and I love retellings! I am looking forward to reading Shifters in the Snow: Bundle of Joy: Seventeen Paranormal Romances of Winter Wolves, Merry Bears, and Holiday Spirits. I have thought and thought and analyzed this. My choice would be "My Sister Rosa." Hi John, I hadn't heard of this but have just read some reviews & it sounds terrific. Thank you. We are Still Tornadoes because I am an 80s girl. Love books that bring in that vibe. Swing Time by Zadie Smith. It sounds like an ambitious, exuberant new novel about friendship and music. We are Still Tornadoes sounds like a great read. I have had Heartless on my TBR list for a while now. It will looks like it will be well worth reading!! I'd love to read the sun is also a star. I look forward most to Heartless by Marissa Meyer because she's my favorite author. I'm judging a book by its cover but Heartless looks intriguing. I am excited for Heartless because I loved the Lunar Chronicles and I love fairy tale retellings. I'm looking forward to reading This is Our Story, it sounds like an exciting book. The Sun is Also a Star and This is Our Story.... It is really difficult not to keep going as there are some amazing books being published this month. I am most looking forward to reading melissa meeyer's new book Heartless. I´m really looking forward to Flashfall. I'd like to get Stephen King's latest book because it is the end of his trilogy. Heartless as I am collecting her series! I'd choose The Wrong Side of Goodbye by Michael Connelly because I love the Harry Bosch series. I'm most looking forward to Archangel's Heart by Nalini Singh. I love the characters in this series, not to mention Nalini Singh's wonderful writing! I've already had a chance to read it: Punk 57 by Penelope Douglas. She's my go to author. I'm most looking forward to Heartless because it sounds like one I would enjoy! Nalini Singh's Archangel's Heart. I loved the book! I am looking forward to Heartless. The sun is also a star, because I really what to read a book by Nicola Yoon. I can't wait to read Heartless, because everyone talks about it. The sun is also a star. I've heard great things! Heartless by Marissa Meyer. I've read some good reviews about it. Thanks for the giveaway! I am looking forward to reading Heartless by Marissa Meyer! I adored the Lunar Chronicles series! Of Fire and Stars by Audrey Coulthurst! It just sounds like something I'd love plus it has diverse characters. Archangel's Heart by Nalini Singh because this series is one of my all time favourites. I messed up the blog loving link. I followed Via courtney gendreau. I am looking forward to Heartless! Kim Harrison's The Operator. I've been a fan of her stories for a long time & I really enjoyed the 1st book in the series. Thanks for the chance. I'd love to read Scythe by Neal Shusterman because I haven't read a good dystopia in a while and I've heard that Shusterman has great moral lessons in his stories. I am looking forward to reading Good Vampires Go To Heaven by Sandra Hill. I love her stories, and she always makes me laugh out loud she has an awesome sense of humor. I'm so excited to read Heartless! It would be great to win a November new release worth $16. forward to reading the most and why? and her characters are interesting. Why do you make me choose... I'll go with Scythe. I hear so many good things about it! Heartless is the release I'm most looking forward to. Why? Well because its a book I just discovered came out while doing this Blog Hop and it sounds absolutely wonderful. Thank you for the chance to win and Happy Holidays! This is awesome. May the odds be ever in my favor. finger crossed! I am most interested in The Diabolic. I have heard good things about it and, I think that I will like the story. I am most excited for Heartless because I love retellings. Meg Harding's CHECKING IT TWICE looks good! I am looking forward to Heartless because its from one of my favorite authors and I love retellings. Oh like everyone else here Heartless! Heartless sounds good and I've heard she's a really good author. I cannot wait to read What Alice Forgot by Liane Moriarty. I heard so many great things about this book! Woot I am a winner!!! !